This post is part of the Outdoor Family Adventure Series. Encouraging families to get active and create lasting memories in the great outdoors! We’ve been doing a lot of hiking as a family this Summer and we’ve learned a few things along the way when it comes to packing food for the trail. Bringing food that is both fun and a good energy source is so important when hiking with kids. 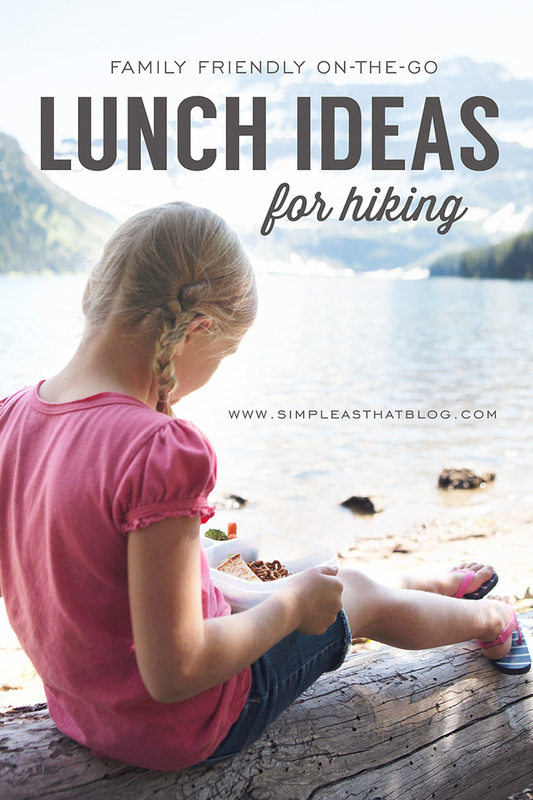 We love packing our hiking food in Easy Lunchboxes containers and today I wanted to share a few family friendly on-the-go lunch ideas that are perfect for hiking! Be sure to scroll down to the bottom of todays post for an exciting giveaway! Packing family lunches when hiking can definitely be a challenge, but one thing I’ve learned with our kids, is that having ample food makes for happier hikers! We’ve done a few hikes where we decided to pack light and just eat when we got back and that temporary convenience was not worth it in the end when we had hungry, grumpy kiddos. You may have read about how much I love packing my kids school lunches in Easy Lunchboxes containers but what you might not know, is how convenient they are for packing lunches on-the-go! 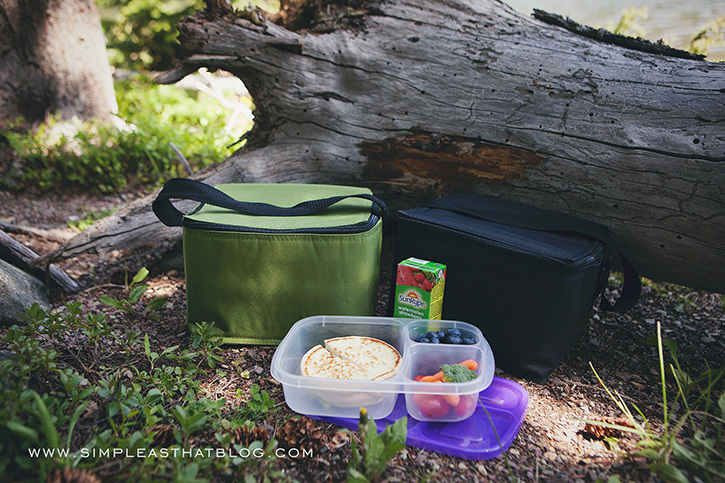 I use our Easy Lunchboxes all the time when we’re road tripping, going on a picnic and most recently when we were hiking in Waterton Lakes National Park. 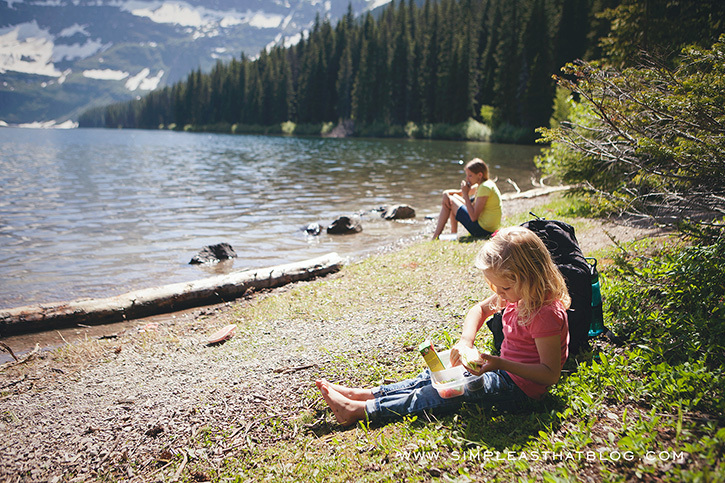 We packed a quick lunch in our handy Easy Lunchboxes containers to take with us on the trail around Cameron Lake and it was so nice to sit out in nature and enjoy a quiet moment together as we ate. -Lunches stay cool in the Cooler Bags which can fit 3 Easy Lunchboxes containers each. In our lunches I packed turkey sandwiches made on mini round naan bread, alphabet pretzels, fresh blueberries and a selection of veggies. We also brought a bag of trail mix and some fruit snacks packed separately. The lunches stayed fresh, put together and cool during our short hike and were delicious! Just the right amount of midday fuel that we needed! What are some of your family’s favorite foods to take with you on the trail? For more ideas of healthy lunches you can pack in Easy Lunchboxes containers I shared a post with a weeks worth of school lunch ideas right here! One of my kids favorites are these homemade pizza buns which would also make a perfect hiking snack! Post 1: What is the Outdoor Family Adventure Series? My husband and I like to take granola bars and homemade trail mix when we go hiking. My girls love trail mix. I like trader Joes Go Raw trail mix. oh this is great! thank you! We are a hiking family as well so I really enjoy all of your outdoor posts. I’m a big believer in being in nature. boy would I love to be in Canada with those views though!! summer in AZ makes it a little tricky to get out and hike, unless we wake up really early of course. 🙂 I can’t wait for fall! Frozen gogurts and homemade trail mix. We love trail mix for hiking. We love to take trail mix. Thanks for the fun added ideas, I know they will come in handy. I love trail mix and granola bars! I love trail mix! And lots of water! 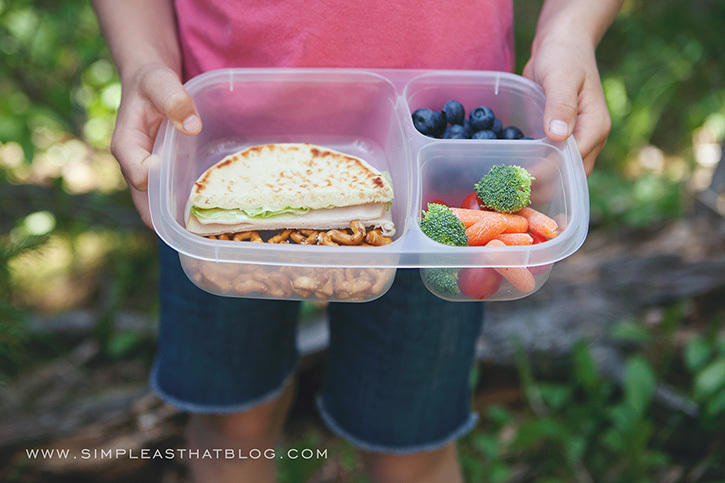 These would be perfect for school lunches or even lunch on a road trip. We like to travel to pints of interest within a few hours of home and these would be great for a nutritious lunch on the road. always love trail mix! it’s a must. I am always saying we need to be more organized with packing lunches. This win would REALLY help me do that! My son is starting kindergarten in August and I am determined to pack lunches like the one you wrote about. Looks delish! PB&J Sandwiches with some fruit, baby carrots and pretzels. We love beef jerky, made locally, and granola bars. I love this series as a mom to a toddler I love to be out and watching your family explore AB is awesome, we love in Calgary. What great containers! Thanks for the tip! Pretzels and granola bars are always easy. We love LOVE outdoor summer adventures. Grapes are one of our favorite snacks — sometimes even frozen for a cool treat 🙂 granola bars are another go to for our family. I always love seeing your creative [[and healthy!]] ideas. Great giveaway! I love getting to bring berries and grapes for my kids! My favorite hiking snack is a homemade trail mix with different nuts, sunflower seeds, pretzels, butterscotch chips, and M & Ms. Beef jerky and water! But for my little one any fruit in season will do. Granola bars are a must-have for my family. We love Kind bars and beef jerky when we go camping and hiking. We LOVE Kind bars too Tracy! So yummy! We love fruit and Trader Joe’s Breakfast trail mix! I adore your blog – I also pack lots of lunches for outings and hikes (check out the “Lunches for Outings” label on my blog). I love your style – and I also love Easylunchboxes!! I love EasyLunchboxes! I need to be better about packing my own lunch for days when I’ll be out! Sorry! Forgot to add that we love the frozen on the go yogurts! Thank you for all these great ideas! Fruit, granola, yogurt, christmas cake. Lunch is often cheese, crackers and meat with veggies. Our oldest has a severe peanut allergy so take and go snacks/foods are often times rice cakes, goldfish or graham crackers, cold meat sandwiches on pita bread & fresh fruits. I’m always looking for healthy lunch ideas for my picky eaters. Love your blog! I would bring almonds and dried fruit on a hike. Jerky, trail mix, fruit (no trash to haul back), cheese–string, sticks or chunks. PLENTY of water even for pets! favourite snacks are bananas and nuts! We love applesauce pouches, string cheese and freeze-dried fruit and yogurt! My favorite hiking snack is trail mix….sweet and salty! My kids always like when we have pretzels and juice. We love to take homemade granola bars, cheese sticks and dried fruit! THanks for the great giveaway and what a lovely blog you have! Gorgeous pictures! Love the idea of easy lunch boxes! Would love to win and try them out for myself. I would love to win for my new kindergartener! We love taking cut up veggies, some cheese and crackers and jerky. Love Easy Lunchboxes – great for school. Our favorite snack to take out on the trail is a mix of nuts, m&m, spicey gum drops and pretzels. Our favorite hiking snacks are granola and fruit leather. We love to take almonds on a hike. My kids LOVE granola bars and fruit snacks. We love taking homemade trailmix out on the trails. It just seems right! Definitely have some granola bars and water on hand. Easy to each fruit is also on our list. We love to bring sandwiches on a hike. Lately we’ve been bringing hummus, a good sized container of it that we all share to dip veggies and pita bread/crackers in. Cut up melon is always satisfying too! Love the idea of these boxes and not using zip lock baggies! Cheese,crackers and fresh berries are perfect in Easy Lunchboxes for lunch on the go! My son’s favorite trail snack is boiled peanuts, but our family loves snack bars, apples, and trail mix with lots of watet. Wondergul giveaway! We love to eat granola bars or trail mix. Thanks for the good ideas! It’s so easy to get into a rut! I like to pack granola bars. We love to bring fruit pouches and homemade ham rollups. We are just starting to do camping and traveling as a family and with food allergies, lunches and snacks have always been and issue. I love finding new healthy ideas that don’t involve prepackaged snacks and foods. My favorite hiking snacks are granola bars and apples. We love to take trail mix and granola bars. I’ve been looking for the perfect lunch containers for the kids and me. Would love to try these out. Trail mix is always a hit! Freezing the juice box is so much easier than putting a freezer gel pack in the lunch box. Also freezing grapes or watermelon is another option. I love these containers and your ideas for healthy lunches and snacks! Thanks for sharing! I like taking home made trail mix, beef jerky and a big bottle of water. We absolutely love dried apricots on hikes. So easy to pack! Granola bars are my favorite hiking snacks! Jerky is great and water. Granola bars and beef jerky are our favorite hiking snacks! We always bring homemade no-bake granola bars. YUM! My kids love mini muffins and Super Store brand alphabet pretzels. My favorite hiking snack is trail mix. I love to take beef jerky on hikes! ~trail mix is a great thing to take on a walk or hike…like you, I linger behind and get parting walking shots or run ahead and get everyone walking toward me. We love pita pocket sandwiches in our Easylunchboxes for easy to eat on-the-go meals. These would be perfect for school lunches!!! Cliff Kids bars are great for the kiddos, and also Trader Joes peanut butter filled pretzels. We enjoyed apples, trail mix and cheese sticks for our hiking snacks. awesome! We always pack our own snacks for on the go! With one picky eater, one with allergies, and one who is always hungry, it’s just easier to have our own healthy snacks on hand! We love trail mix, apples and blueberries when we’re hiking. We love clif bars! My kids especially love the kids clif bars. Trail mix & goldfish are our go to snacks! homemade granola bars with chocolate chips is a special hiking treat for us. 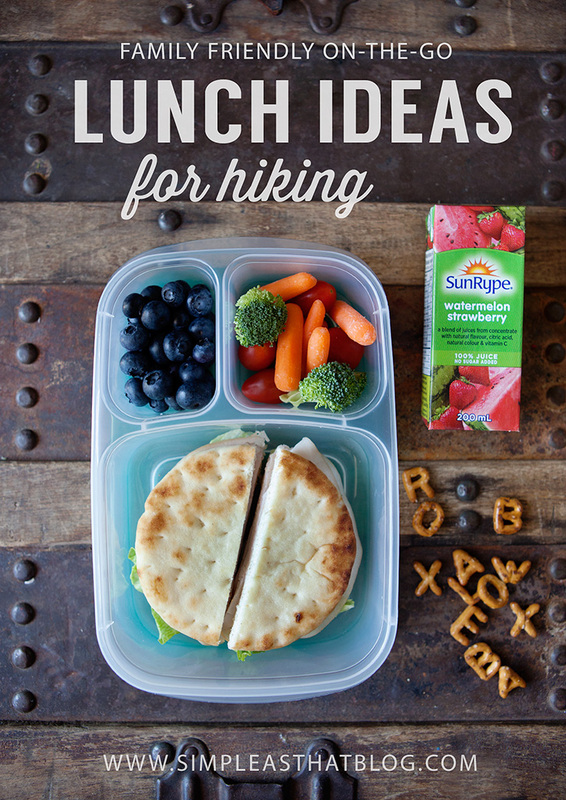 Snacks or a picnic are definite must-haves for a family hike and I love your suggestions. I do like how the lunch doesn’t get crushed in the plastic containers, but am wishing for a backpack option for the coolers. This is something I’ve always struggled with. I’m just not a lunch person. I love all of the images for this post and would be honored if you would come share at Pin Your Friday Favorite! Have a great weekend! Can’t beat trail mix and jerky. Dried fruit and granola bars also. We love hiking and love doing cheese/ meat/ crackers with sausage meat. And pickles for some of us. Can’t wait to try some of these great ideas! Thanks! My kids are all about the snack on the hike! I like to let them mix their own trail mix. They get to pick what they like and it’s always a winner! We love homemade granola with yogurt and fruit. We love granola bars and trail mix! My family likes granola bars, grapes, pretzels and water. I love anything that makes packing lunches easier! Trail mix! I make my own with peanuts, m&ms and raisins. Mmmm…trail mix for sure – thanks for the chance to win! Thanks for the great lunch ideas! With two little ones, we are always trying to keep packed food ultra organized, which makes it easy on both of, us as well as the kids, to find what we need! I love easy lunch boxes, the easiest way to pack a lunch! Home made lunchables and fruit! We love Wheat Thins Toasted Chips! We like to take trail mix and fruit. We love Easy Lunchboxes in our house!! Love this idea of 3 different sized compartments in one container. Would definitely be nicer than carrying multiple containers in a plastic bag! I hate paying for fast food, and I LOVE the lunch box containers! I am for sure getting some of those. We like Granola bars, dried fruit and nuts when hiking. I need these for my 3 kiddos! They love fresh fruit, fruit leather, trail mix & jerky! We love trail mix with lots of nuts and sesame sticks! We love granola bars and frozen grapes. Ahhhh! I love these so so much. My son calls them his ‘bentos’ and he loves them too. Would love to have more to add to the collection – with these I’d be able to pre-make his school lunches for the whole week! I love compartmentalized containers for taking lunch to work. Makes things so easy! I used EasyLunchBoxes last year and they were the best! I need to replenish my supply. usually some sort of trail mix or larabars! Always looking for ideas to make lunch more interesting. Trail mix and bars. Love my easy lunc boxes and am always looking for good, healthy ideas that my kids will eat to put in them. My favorite trail snack is smarties. My family loves to snack on homemade granola. I know…. It’s cheesy to say it… But trail mix. It’s easy to make different varieties, super healthy, easy to tote around, and can please everyone in my family along with provide a good boost of energy! Great suggestions. I feared the containers would be too bulky but looks like you got them to work out nicely. It seems like everyone said it, but nuts and fruit are my favorite thing to take hiking. Love these ideas!!! Where did you get the alphabet pretzels? They are adorable! Thanks. They’re by President’s Choice. I purchased them in Canada.